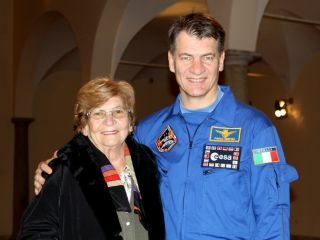 European Space Agency astronaut Paolo Nespoli with his mother in November 2010, shortly before he launched to the International Space Station. Italian astronaut Paolo Nespoli on the International Space Station is mourning the death of his mother this week, but had to miss attending her funeral today (May 4) because he won't return to Earth until later this month. Nespoli's mother, Maria Motta, 78, died late Monday (May 2) in her hometown of Verano Brianza just outside Milan. Nespoli was notified immediately by the European Space Agency (ESA) in a private call to the space station. Motta's funeral took place today in Verano Brianza at 8:30 a.m. EDT (1230 GMT). Half an hour later, as the space station flew over Italy, the crew stopped work and observed a minute's radio silence to honor her memory. "We all are in our minds very close to Paolo and his family, and try to give him sufficient strength in space to cope with this difficult situation and overcome this severe personal loss which is already very difficult in normal conditions, but for Paolo being still on the International Space Station it is even harder," said Michel Tognini, former ESA astronaut and the head of the European Astronaut Center, in a statement. "There are probably no words that could relieve this sadness but our thoughts are with Paolo, his family and friends," Tognini said. ESA's director general, Jean-Jacques Dordain, and the director for human spaceflight and operations, Thomas Reiter, also contacted Nespoli to express their condolences and the agency's support. Reiter attended the funeral on behalf of the agency, while fellow Italian astronaut Samantha Cristoforetti delivered the condolences of the European Astronaut Corps. To help Nespoli cope with his mother's death, ESA's flight director and support team modified his work schedule. Nespoli launched to the space station in December. He is one of six people currently living 220 miles (354 kilometers) above Earth in the orbiting outpost. Two Americans and three Russians make up the rest of the crew. Astronauts who serve long-duration missions on the space station are given special briefings and training to help them prepare for being away for an extended period of time. This preparation includes topics such as family support and the potential deaths of friends or family. Nespoli, like his other station crewmembers, has regular access to an Internet protocol phone to call his family, as well as email and other Internet communication tools. NASA and space station mission control will also provide support to Nespoli as he copes with his loss. "As an ESA astronaut, ESA will be the primary provider of psychological support for Paolo," NASA spokesperson Nicole Cloutier-Lemasters told SPACE.com. "However, Mission Control and NASA flight surgeons and support team are certainly available to assist as needed."